MetalKraft™ Systems is the premier manufacturer of quality metal folding table legs. We span three decades of excellence. Our customers consist of some of the industry's leaders in metal and folding table manufacturing. 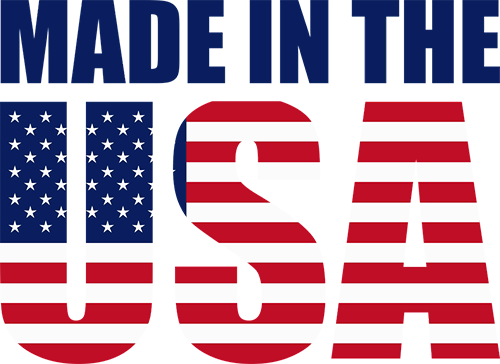 We are committed to manufacturing only the highest quality table leg products. 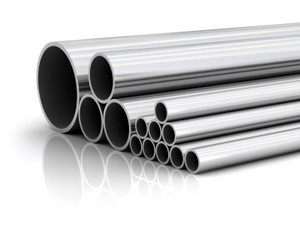 We start with the finest steel and tubing to develop the highest possible quality. Strength and durability are the hallmarks of MetalKraft™. Our product confidence allows us to offer a two year warranty on our line of metal folding table legs. MetalKraft™ now supplies all non-adjustable table legs and risers with an attractive, high quality, black hammertone powder coat finish. Powder coated surfaces are more resistant to corrosion and fading, therefore the finish stays bright and vibrant longer than traditional zinc plated finishes. Additionally powder coated surfaces are more resistant to chipping, scratching and wear than other finishes. Our design and development staff is prepared to evaluate your needs and specifications for metal folding table legs. MetalKraft™ takes pride in all of the aspects of the customers product, as we are committed to the highest quality product. For example, our riveting process has been developed for solid rivets. We utilize the highest quality processes to ensure an attractive product, and a product that will be durable for many years. Our commitment to technology has yielded us some of the most modern equipment in the industry. This state of the art equipment, in conjunction with a skilled staff of welders and machinist craftsmen, has made MetalKraft™ a leader in metal fabrication. The average employee has a minimum of fifteen years experience, and that experience translates into high quality. We are dedicated to high quality and safety. The Sur-Lok gravity locking system is standard on our legs to insure they offer years of wear and security. Just pull the table legs into position, turn the table over, and the locking system will engage! The process of welding is one of the most diversified processes. Many companies use this process to cut costs. MetalKraft™ is more concerned with quality products that will be durable for years. 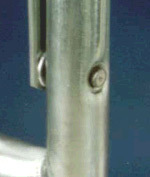 On non-adjustable legs, the cross member to leg weld is a full 360º MIG Weld. This is critical in the stability of the table. The type of weld is an integral part to the continued use of the hinge assembly: If the weld fails the product is useless. MetalKraft™ inserts the cross-member into the stamped opening, and only then is this weld applied. MetalKraft™ is committed to a product that performs fold after fold. This high quality weld offers that assurance. The importance of manufacturing the highest quality product is demonstrated clearly in the detail that MetalKraft™ utilizes in the manufacturing process. Every aspect is carefully thought out and planned to achieve the best possible product for our customer. 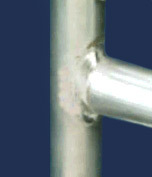 MetalKraft™ utilizes 3/16" solid steel rivets in the hinge assembly (not semi-tubular rivets). The added benefit is long term durability and strength. 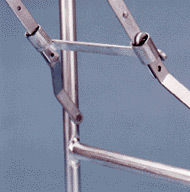 The leg is further strengthened at the top L bracket and the hinge assembly to leg assembly with ¼" solid steel rivets. Radial riveting ensures their integrity and contributes to the sleek appearance of the assembly. This process complements the look of the finished product.